I’m still not feeling creative enough to work on the story-blogging, so you get two posts in a row that are mostly straight-up fashion blogs for me. Sorry about that, and I do promise to get back to the story blogging as soon as I can. I’ve been blogging Hairology for a few months now, because it’s one of my favourite events. This would be because I’m a complete SL hair addict (I hear my friends going, “No!”). This month, Hairology gave the designers a month to rest, because Hair Fair is just around the corner (OH YES! ), so the Hairology designers have put some of their favourite styles out at a discount this month. So there’s great hair there at discounts of between 25 and 50%, not to mention many of the creators have little cakes in front of their stalls, which contain (YES!) free hair! There’s so much good stuff at this event I can’t possibly show you all of it, so I’ve picked just six styles to highlight. First up, Wasabi Pills! Wasabi Pills has been a staple of Second Life hair since I started coming back to SL to role-play about five years ago, and I used to pretty much live in Wasabi Pills hair. This is one of my favourite styles she’s done in some time, and it’s called Ocean. It’s available at Hairology for 50% off for the duration of the event. Now, because I can never highlight just one thing, I’m also playing with some different skins in this post, and of course I’ll tell you all about the clothes as well. I’ve also indulged in a little SL tourism in this post, so I hope you’ll enjoy the great photo locations and maybe visit a few of them yourself.Gwyneth is wearing a Glam Affair skin here; I picked up the Viktoria Catwa applier at this month’s Collabor88, and of course the Maitreya body is loaded with Glam Affair skins, so I didn’t have to worry about body appliers for this one. I wanted to keep all the skins in the same shade range that Gwyneth normally wears: as a Sidhe, she is naturally pale but healthy looking; this is tone “Europa”. The dress is from Tres Blah; it was in the May Luxe Box. Body is Maitreya, Head is Catwa Helena, eyes are Soul Sidhe Eyes, ears are BentBox Sylvan Ears. This location is The Yorkshire Dales. This location is The Yorkshire Dales. It’s in the SL Destination Guide Editor’s Picks at the moment, and it’s well worth a visit. The poses here are from the Bauhaus Movement Luna Beam series, which I picked up at this month’s Liaison Collaborative. And here we have hair from Phoenix! And here we have hair from Phoenix! The style is called Kathy, and it’s 25% off at Hairology this month. The skin here is one I’ve already showcased in the last blog entry, but it’s worth an extra mention: it’s 7 Deadly s[K]ins Leslie head applier in new colourway Sand. The crown is the Kibitz Mynerva Circlet, and the necklace is Serena Teardrop, by Maxi Gossamer. The dress Gwyneth is wearing here is very special. The dress Gwyneth is wearing here is very special. 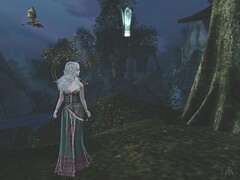 It’s the Callista Rain Wedding Gown Set from Silvan Moon Designs. Who are Silvan Moon Designs, you ask? They’re a collaboration between The White Armory and Blue Moon Enterprises, and as you can see, this style is just stunning. It comes in a variety of colours and has that amazing flowing-but-fitted look that Bee Dumpling manages to put across with so many of her designs for The White Armory. Body is Maitreya, Head is Catwa Helena, eyes are Soul Sidhe Eyes, ears are BentBox Sylvan Ears. The first pose is from !bang, number 562. The second one is again from Bauhaus Movement’s Luna Beam series. The location is The Balladwood, which is part of my sim. Mina hair always has something to offer; this style is Juliet, available at Hairology for 50% off this month. Mina’s textures are so lush! I wanted to take Gwyneth somewhere hot to shoot this photograph, so I picked New Brighton Beach Pier, which is one of those places that’s been around in Second Life for ages and still manages to be a fun location to visit and great for photography. You can even rez stuff there, so it’s easy to get your poses exactly the way you want them to be. The clothes are from the current round of Cosmopolitan: they’re from Asteria, part of a mix-and-match collection of sleeveless blouses and short-short skirts called Taylor. The shoes are Empire, the Erica flats from the most recent Enchantment round. Body is Maitreya, Head is Catwa Helena, eyes are Soul Sidhe Eyes, ears are BentBox Sylvan Ears. Here’s a closer shot of this beautiful Mina hair. Here’s a closer shot of this beautiful Mina hair. The skin in these photos is from LeForme, and it’s my first LeForme skin. Well, second, really. See, I liked the LeForme skin that was on sale at this month’s We ❤ RP, but it was too dark and freckled for Gwyneth, so I went to their main store and picked up this one as well, Luna, in their Pale shade. I about tripped myself up looking for body appliers in their main store before I realised they were all right there in the skin package! Both these poses are from the An Lar Kildare series. Pr!tty! I travelled back to White Owl Island for these next two photographs. White Owl isn’t ready to open yet, but we have kitted out the book store, as you can see! Now, I don’t buy a lot of Pr!tty hair, mostly because the styles are a bit too sleek for Gwyneth. But this style, Navi, I think I first bought at The Chapter 4 a while ago, and I love it—and not just for the sparkly headband that comes with it! It’s at Hairology for 25% off, so I fatpacked it since I only had one colour previously. Because, you know. One day I might want pink ombre hair. (What? I really might! Stop looking at me like that!) Are these jeans not amazing, by the way? They’re from Purple Moon, and they’re at this month’s On9 event. The shirt is from The Vintage Fair, which really must visit if you haven’t yet; it’s made by Gawk, the Anthracite Favourite Sloppy Sweater. I picked it up because ICly, Gwyneth is originally from London and she feels a bit nostalgic about it from time to time. These shoes are Reign‘s Kiko Flats from this month’s FaMeshed. The base remains the same: Body is Maitreya, Head is Catwa Helena, eyes are Soul Sidhe Eyes, ears are BentBox Sylvan Ears. Still Pr!tty In this photo, you can see the light-uppy headband better. Gwyneth loves crowns, being a Queen, and she also loves things that light up, being Gwyneth, so those two things stuck together make her a very happy Fae Queen. This skin is from The Skinnery, another kind of skin I’ve not worn in ages. I really liked the Magali Catwa applier (in tone Milk) they had at Collabor88, though, so I took the plunge and invested. And, boo-yah! When I went to the Skinnery main store to pick up body appliers, I found that they make appliers for my beloved BentBox ears! Happy, happy day! These poses are from the InMotion Summertime set, which is available at this month’s round of The Instruments. Next, we move from White Owl to Everlong. I know I’ve shot in Everlong before, but I think a few things have changed since I’ve been there. I discovered this fun stage, and I liked the sentiment expressed on the white board, even if it is an old General Foods’ International Coffee slogan. I also love anything that has to do with swans. Anyway, Taproot is another hair I’d bought in only one colour previously, but the 50% off price at Hairology enabled me to buy the fatpack! The clothes are the Spirit Sianna Jeans and Shirt, available at this month’s Collabor88. The shoes are also available at Collabor88: they’re the Schadenfreude Flannery Loafers. As always, Body is Maitreya, Head is Catwa Helena, eyes are Soul Sidhe Eyes, ears are BentBox Sylvan Ears. This and the pose in the photo that follow are both from the An Lar Hollow series. Here, you can see the texture on the Mithril Apothecary Taproot hair a bit better. The necklace Gwyneth is wearing is the Bellona Necklace from a Tia gacha, though I couldn’t tell you which event I got it from. As for the skin, it’s from DeeTaleZ. I have long been a fan of DeeTaleZ skins; this is one of their recent Catwa faces, Fable, in their lightest shade, Celtic. And finally, here is No Match‘s No Answer, which is at 25% off for Hairology. Once again, the clothes come from Collabor88: the Addams Rocker Zipper Jeans and Tina Classic Shirt and Bra. Gwyneth’s basic construction remains the same: Body is Maitreya, Head is Catwa Helena, eyes are Soul Sidhe Eyes, ears are BentBox Sylvan Ears. Now, this location is a place I just found out about today through Ziki Questi’s Blog, The Gates of Melancholy. You have got to visit this place. It’s stunning. Designed after the paintings of Andrew Wyeth, I could not get enough of this sim. In fact, if I hadn’t already shot all those photos in other locations and this had been my first location, I would almost certainly have shot the whole set in The Gates of Melancholy. But I’m too lazy to reshoot ten photographs, so you get The Gates of Melancholy as a sort of “last but not least”, even though that might be a cliché. Might be. Anyway, not since I discovered Windwept have I been so utterly enamoured of a SL location, and you can bet I’ll be back here to shoot some more. In fact, I can almost feel a story coming on, just looking at this place. And isn’t that what the best places in SL do, anyway? They inspire us. They make us want to create, ourselves. Now for a closer look at Gwyneth at The Gates of Melancholy. This time, the skin is one anybody who reads my blog (all two of you! Thanks!) will find very familiar: it’s Lumae’s Eirtae, in her lightest Tone 1. Lumiya Rae also makes appliers for my beloved BentBox Sylvan Ears, which is only one of the many reasons why I love her and her skins and why I’m so proud to be a Lumae blogger. I’m really chuffed to say that just today, she updated this skin. Of course, I’d already taken these photographs, and we know from above that I just can’t be bothered to go back and reshoot photos. However, the next time you see Gwyneth in Eirtae, it’ll certainly be the updated and repainted version! By the way, if you own the Bare version of Eirtae and you haven’t received an update yet, Lumiya says there are thousands to be sent out and you might get them quicker by popping by the Lumae Main Store and hitting the redelivery terminal there. So just to wrap up, this month’s Hairology is worth a visit for so many reasons, not just these six. There are so many more great discounted hairstyles waiting for you there, not to mention the freebies inside the cake pieces! And don’t forget that the most exciting thing about all this is the reason why Hairology is offering discounted hair this month: the designers are being given time to prepare their wares for Hair Fair, which opens on the 16th of July! I can’t wait! No Style Cards today; they’re all embedded in the text. I’m making a concerted effort to credit the great pose creators whose work I use in my blog posts. I haven’t been doing that, mostly because I use an Ani-Mate Pose Hud most of the time, and so I cycle through poses very quickly. From here on out, I’m going to try and make sure all poses are credited, not only so that folks know where they might find them, but so I myself can remember which ones I used! Spiffy photos taken with the indispensible aid of my LumiPro. I never ramble for hours about hair and skins without it!